Due to the Super Bowl being on this weekend, the mystery dinner has been postponed. We will be having it on the 9th. Sorry about that! 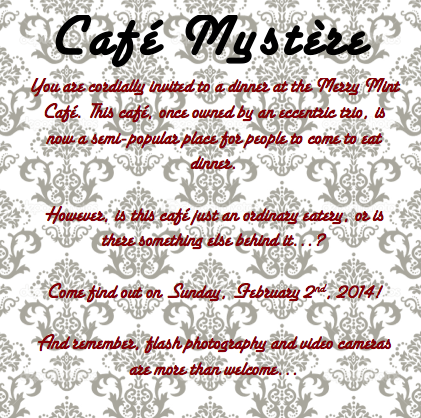 Come to a mystery dinner at the Merry Mint Café this Sunday! We’re hoping to have it at 9 PM Bearville time (EST), but the time might change, so keep coming back to check! What do I wear? Dress however you like – our dress code is casual (just no distressed jeans, swimwear, stuff like that)! Staff members will be told what to wear beforehand depending on what they will be doing. Rides are not permitted in the Merry Mint Café under any circumstances. Can I take pictures/make a video? Certainly! We at the Merry Mint Café encourage photographers and filmmakers to spread the word about us! We do ask, though, that you inform us if you’ll be making a movie about our café beforehand. Can I invite a friend? Sure! We have room for up to 9 patrons (though we don’t think we’ll have that many), along with our staff members. Please comment if you’ll be able to make it! Sorry, I’d come but I don’t go on Bearville. And I probably never will.